I'm not really a blog-guy, but I figured this would be a good place to share news, show off new stuff, and allow you to get a glimpse inside the twisted mind of a man who prances around in a wrestling mask and calls himself "Papi". 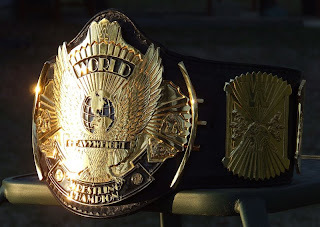 I'm assuming you found this blog through my custom championship belt page; if not, you can check it out here. I guess I should start by talking about my belt idol, Reggie Parks. Reggie is "The King of Belts" and the very reason that I got into this. As a kid, I can vividly remember all these larger-than-life wrestling superstars fighting for or defending championship belts made by Reggie Parks. I can also remember how badly I wanted to hold one of those bad boys (the belts, not the wrestlers). I figured the only way I'd ever get my hands on one was to become a professional wrestler and work my way up the ladder. Unfortunately, I have two left feet and a strict no-weightlifting policy, so that idea was out the window. Well, as much as I love my Reggie "Winged Eagle," I still felt that I needed more -- I needed to create. So I started designing belts, and that was fine for a while. Then I started messing around with leather. Eventually I worked my way toward creating my own belts. I'm still very much a rookie, but I'm working hard to improve my skills. You can see photos of my work on my website, if you haven't already. And that's my story. I'm a full-time graphics/web designer and a part-time championship belt-maker. I'm also a full-time husband and father, which is definitely my most important job. My goal is to earn a living from making belts some day, but I realize it's a long, hard road, and my chances for success are probably slim. But I'm just getting started and I'm very confident in my abilities. I may never be "the next Reggie Parks", but I will certainly give it my best try. It's either that or start hitting the gym. I think I'll stick to making belts.